Sensitivity (theoretical) -62 dB/@ 1um ampl. 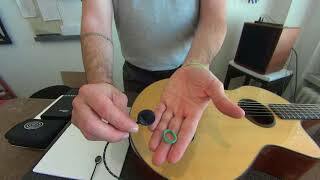 "The Dyn C is the best compromise between a magnetic pickup and a condenser mic. Since I’ve begun using it I have been very happy with my sound. The Dyn C delivers th punch of a magnetic with the great acoustic tone of a microphone." "In a mystical way the project took off, and in very short time, about six months, and after many journeys to Cremona, my new compact and beautiful Tri-Kanta Veena was ready. 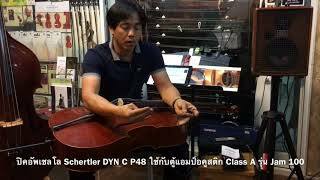 I am using a Schertler pickup for Cello under the center bridge." "As a MOZART HEROES cellist I need a good acoustic cello sound as well as a great distorted sound. Everything is possible with the Schertler Pickups, and then combined with the Yellow Blender, i am sure everything will be as authentic as possible. The Schertler products, in my opinion, are the best on the market!" DYNs after the first test. The coil/magnet mechanism is hidden under the blue shock damper. The decoupled magnet’s weight is only 0.6 grams and therefore its response is very fast.